The FTD® Golden Autumn™ Bouquet pops with the bright and beautiful colors of the fall season ahead to send your warmest wishes straight to your special recipient's door! 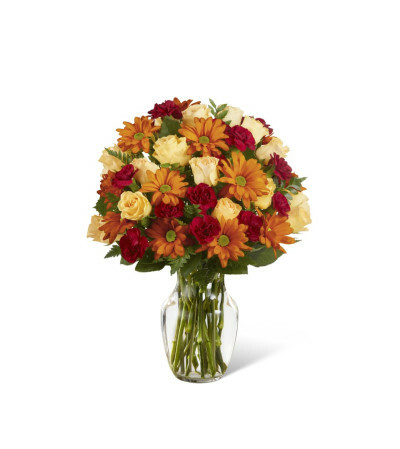 Burgundy mini carnations are a standout choice arranged artistically amongst eye-catching butterscotch daisies and peach spray roses, accented with lush greens. 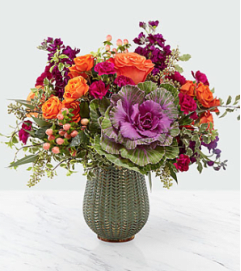 Presented in a clear glass vase, this harvest bouquet is ready to add to the treasured moments of the fall season ahead, making this a perfect thank you, thinking of you, or Thanksgiving Day gift. Thankyou Calla! 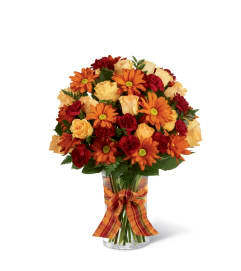 Your online ordering was very easy, and I was sent a picture of the delivered flowers. Beatiful and beyond my expectation. Thankyou for sending the flowers for me to my Uncle's funeral, they were beautiful and your delivery of them was incredible. The flowers were very beautiful, although I went on the site to order them and I feel as if the lady made it seem like it was my fault that her prices were incorrect on her website were I ordered them. They did honor it still just felt alittle rude to me considering I bought them off of there website.